We're from Minnesota. It's the Land of 10,000 Lakes, so we know all about fishing—it's a part of our genetics. We've got Muskies, Crappies (pronounced "craw-pee" and not the way you were thinking), Walleyes, Northern Pikes and Sunfish, but we're always on the hunt for a new catch. We're always looking for the biggest and baddest fish on the lake, since that's what gives you the best bragging rights with your buddies. Unfortunately, we only seem to be able to catch normal-sized fish. We decided to get creative. If we couldn't catch a legendary fish, then we might as well fake it! We decided to make a kid's costume based on a new species of fish! When you dress your child up in this Fish costume, you'll have ALL the bragging rights. We're pretty sure none of your friends have caught a fish as unique and big as your child wearing this costume. 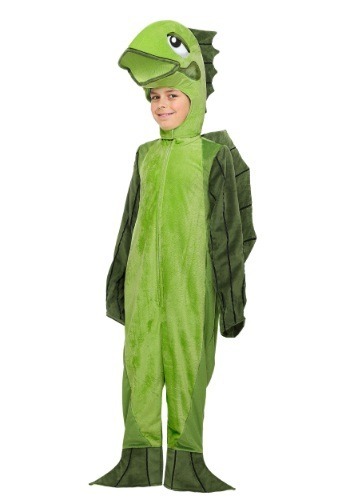 The costume comes with a green jumpsuit that zips up in front, with sleeves and footies that are designed to look like fins. The back has a fabric dorsal fin attached to it as well. The hood finishes the look, since it turns your child's head into a big old fish head! The hood has a cute, yet fishy style and it fits easily with velcro under the chin. You can suit your kid up, then call your friends to tell them about the whopper you just caught on your last fishing trip!